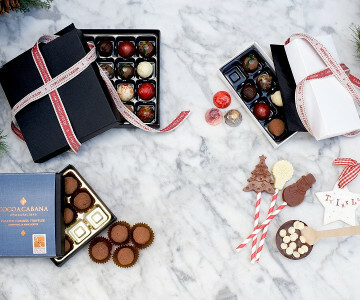 Whether you’re sweet or savoury, our Christmas Range has something delicious for everyone. With showstopping products handpicked from our local producers, we’re on hand to make this Christmas extra special. Read on to find out more about the Cheshire Cheese Company, and Cocoa Cabana, who we’ve partnered with this season. Wensleydale & Cranberry – a Christmas staple, this creamy cheese is delicious with the tang of cranberry. Caramelised Onion & Rioja – one that the Cheshire Cheese Co are especially known for, this is an award-winning cheese for a reason! Traditional Cheshire Cheese – founder Ruth’s favourite, with a good dollop of chilli jam. Luxury assorted chocolates – the perfect gift for a chocoholic, this is a selection of Cocoa Cabana’s very finest luxury chocolates. Luxury salted caramel truffles – these mouth-watering treats have won both a Great Taste award and an Academy of Chocolate award. Chocolate lollipops – yummy treats for little ones, these have been crafted from milk, white and dark chocolate. With plenty more to choose from in our full Christmas range – you can browse all our products here. Everything in our Christmas range is available to order now, right up until the 22nd December - with free delivery to your doorstep. If you haven’t used the LoveLocal discount code yet, why not treat yourself to 50% off your Christmas Best of Local order?